NEW YORK, Dec. 18, 2018 /PRNewswire/ — Earthbound, a leading product design, licensing and brand growth company, today announced a new global agreement with Ford Motor Company, the iconic automaker with legendary nameplates including F-150 and Mustang, as well as exciting new vehicle launches on the horizon in 2019 and beyond. Earthbound will assume control of the existing licensing program across all categories including Lifestyle Apparel, Accessories, Electronics, Auto Care and Accessories, Toys and Games, Interactive, and more. Through this new agreement, Earthbound will leverage their product design, retail and brand building expertise to maximize the current licensing programs with a strong focus on product while also exploring new opportunities. Samsonite and DuPont Kevlar have joined forces for The SXK Collection, a bag collection that featured DuPont Kevlar fibers. Earthbound, Samsonite’s representative, brokered the deal. The new collection is marketed toward business travelers and includes the Amped Duffel, the Slim BackPack, the Prime Expandable Backpack, the Rolltop Backpack and the Core Messenger. SANTA MONICA, Calif., May 9, 2017 /PRNewswire/ — Licensing Expo, the world’s largest and most influential licensing industry event, is pleased to announce that more than 5000 brands from consumer goods and lifestyle categories including accessories, automotive, corporate, fashion, food and beverage, household, publishing, sports and non-profit will exhibit at Licensing Expo 2017. The Expo returns to the Mandalay Bay Convention Center in Las Vegas, NV, May 23-25, and is sponsored by the International Licensing Industry Merchandisers’ Association (LIMA). Household and lifestyle brands represented at the 2017 Expo include: American Honda, American Red Cross, AT&T, Baby TV, Coca-Cola, Billboard, Boy Scouts of America, Butterfinger, Comedy Central, Crayola, Hawaiian Tropic, The Hollywood Reporter, Kelly Ripa Home, Marilyn Monroe, Nestle, Pop Tarts, Rice Krispies, Road & Track, San Diego Zoo, Scott Living/The Scott Brothers, Starter, Shell, Tide and Volvo. In addition to top brands, more than 30 licensing agencies will exhibit at the event including: Beanstalk/Tinderbox/Blueprint, The Brand Liaison, Brandgenuity LLC, Creative Licensing Corporation, Dimensional Branding, Earthbound Brands, Global Icons, Iconix Brand Group, IMG Worldwide Inc., Jewel Branding & Licensing, Inc., The Joester Loria Group, Licensing Management International, Licensing Matters, LMCA, LoCoco Licensing, One Entertainment, Seltzer Licensing Group, Sony Music Brand Solutions, Striker Entertainment, The Sharpe Company, TSBA Group, The Wildflower Group LLC and Wild Apple Licensing, among others. New activities featured at Licensing Expo 2017 include an Agents’ Business Forum, part of Licensing Week, on Thursday, May 25, 11:00am-12:00pm. Brand owners are invited to join exhibiting licensing agents for a morning of networking, coffee and pastries. Exhibiting and attending brand owners can simplify the process of finding representation for their brands by exploring available agents, getting advice from industry experts and connecting with other brand owners looking for an agent. The event is free to guests with an Expo pass but RSVP is required. Launched in 1980, Licensing Expo is the world’s largest and most influential annual trade show dedicated to licensing and brand extension. The show floor is merchandised into two zones: Characters and Entertainment and Brands, Agents and Design. More than 16,200 retailers, licensees, manufacturers, distributors and licensing agents attend the Expo from more than 67 countries. Licensing Expo is organized by UBM plc. UBM is the largest pure-play B2B Events organizer in the world. Our 3,750+ people, based in more than 20 countries, serve more than 50 different sectors. Our deep knowledge and passion for these sectors allow us to create valuable experiences which enable our customers to succeed. Please visit www.ubm.com for the latest news and information about UBM. The Global Licensing Group at UBM is the global licensing industry’s leading tradeshow organizer and media partner. Its mission is to provide opportunities around the world to bring brands and products together to explore and cement licensing partnerships. The following events and information products are produced for the licensing industry by the Global Licensing Group: Licensing Expo (May 23-25, 2017), Brand Licensing Europe (October 10-12, 2017), Licensing Expo Japan (April 28-30, 2017), Licensing Expo China (July 18-20, 2017), NYC Summit (March 2-3, 2017), License Global magazine, License Global Daily E-news and License TV. NEW YORK, September 7, 2016 – Earthbound Brands, a leader in brand management and licensing, today announces that it is getting into the driver’s seat with American Honda Motor Co., Inc. to steer the company’s licensing strategy. The agency has been tapped by the venerable brand to manage and build upon the existing licensing program for its Honda/Acura Automotive and Honda Powersports brands. The New York-based agency will look to build American Honda’s presence across a range of product categories in the U.S. effective immediately. Earthbound Brands will assume control of the existing licensing program currently comprised of more than 100 partners across a variety of categories. With an eye forward to building a more robust merchandising program, Earthbound will concentrate on several core product categories including Lifestyle Apparel, Accessories, Motorcycle Gear and Equipment, Bicycles, Novelty Products, Appliances and Electronics, Auto Care and Accessories, Toys and Games, and Gaming. American Honda joins a roster of corporate brands at Earthbound Brands that include DuPont, Cooking Light, Better Homes and Gardens, Cover Girl, InStyle, and others. The company started in 2000 and launched the breakthrough partnership between Isaac Mizrahi and Target, creating the model for celebrity/retail collaborations to come. 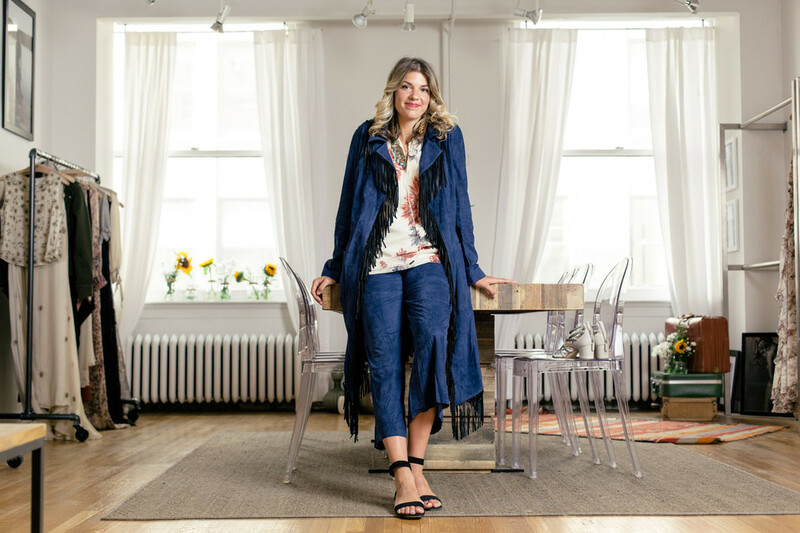 Cady Vaccaro, creative director of Haute Hippie, says the balance is key to pulling off sophisticated bohemian looks. Pictured here in the midnight suede fringe coat and cropped Wide-Leg Pants with printed blouse. Bohemian looks are currently ubiquitous. But while the vibrant colors and patterns and the bold flowing silhouettes and shapes have their allure, it can be tricky to ensure that you’re not overdoing it. New York – Sustainable luxury brand Portico is repositioning, returning to its New York roots and relaunching this month on Bloomingdales.com. It’s also preparing to expand into a host of new categories, including furniture. Portico was originally a retail store in New York’s SoHo district that attracted interior decorators, architects and shelter book editors. The store went out of business in 2004. Today the brand is owned by earthbound, a New York-based designed studio and licensing agency. The new soft home collection, which is produced under license by WestPoint Home , previewed in January at the Atlanta International Gift & Home Furnishings Market. “We’re putting it back in front of the interior designers it started with,” said Cayla O’Conner, earthbound product development manager. James Ngo, earthbound vp of licensing and business development, said the brand is now positioned as “responsible luxury.” The company’s brand book defines Portico’s competitive set as Frette, Matouk, DKNY, Ralph Lauren, Barbara Barry, Calvin Klein and Hugo Boss. The brand – a charter member of Textile Exchange, the Organic Trade Association and the Organic Fiber Council – is also amplifying its sustainability proposition, according to Danielle Dorn, earthbound design director for licensing. “Some components might be fair trade or ethically sourced,” she told H&TT. In addition, earthbound is looking to expand Portico into indoor furniture, outdoor living, dining and entertainment, mirrors, hardware, lighting, frames as vases. Distribution targets for the brand include better department stores, specialty stores, catalogs and e-commerce.